I was a lucky teenage Christian, way back in the 1950s, in rural northern Indiana. I was one of three brothers, and our devout Methodist mother bequeathed us her faith. It was never an option not to go to church on Sundays. We said grace before meals and read the Bible. But there was never anything extreme or heavy-handed about this, so I was lucky. We never know as much about our parents as we would like, so it’s a mystery to me that my mother, born in 1905 in southern Indiana, never drifted into fundamentalism. Moreover, she had great distaste for evangelicalism. Although she never went to college, she had made a great effort to expand her horizons; she was a voracious reader, especially biography and history. Even our minister was surprised when she purchased the 12-Volume Interpreter’s Bible, a product, for the most part, of liberal Protestant scholarship. She wanted to study the Bible, and I too dived right into those books. I first encountered folks of this mindset when I went off to college; these days, of course, they are among the most high-profile Christians. How do people get captured by this brand of piety? What is this level of religious intensity really like? 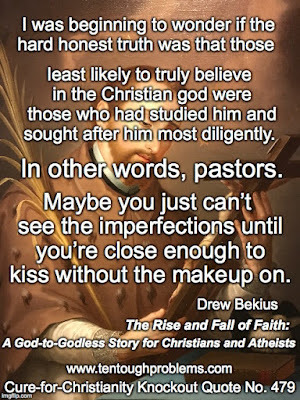 We get a fascinating insider tour of this world in Drew Bekius’ book, The Rise and Fall of Faith: A God-to-Godless Story for Christians and Atheists. Naturally, this kind of cult obsession finds its justification in Jesus’ words in Matthew 22:37, “You shall love the Lord your God with all your heart, and with all your soul, and with all your mind.” This is one those texts that makes Christians feel warm and fuzzy, but that few take seriously. ALL your heart, soul, and mind? Who does that? Unless they retreat to a cloistered life, how would they do that? Who even tries? Bekius was among those who tried. Skeptics, atheists, and moderate Christians should listen up. It’s important to understand how this religious mentality works, and why it is usually so impervious to critical thinking. These folks know God. Bekius broke away, and we can benefit from paying close attention to his story, especially since he tells it so well. I found this book hard to put down. Bekius describes at length how three youthful prayers helped to lock in his faith. • In the sixth-grade Bekius also struggled from crippling depression, and he describes his decision to ask God for relief. “I cried out to him with a prayer that set my body aflame with goose bumps as I told him how much I truly needed him in my life. Now more than ever. With a great gust of Baptist informality, I told God that I was no longer sure anything could heal my depression, but that if there was any hope for healing, it had to be in him.” (p. 37) He reports that God lifted the depression immediately. • The third big prayer brought relief to his love life! He knew he could never date a non-Christian girl, so God answered his prayer by bringing a girl with whom he was smitten into the Christian fold. And they eventually married. In his splendid Chapter Six, “Cracks in the Wall,”(about 25 pages) he highlights ten Bible contradictions that have caused so much anguish. He describes his own ‘determined creativity’ to reconcile the two irreconcilable stories of how Judas died, which he displayed teaching a Bible class. But nobody was buying his tortured apologetic, and one guy in the class suggested that the different authors had indulged in poetic license. The details didn’t even matter. The Bible didn’t have to be flawless. Oops. There was a pat on shoulder from one of them, but nothing more: “A whole room full of pastors avoiding eye contact. Zombie stares into outer space and nervous awkward twitching.” And there was no follow-up curiosity. Maybe he had hit too close to home. We follow Bekius’ story as he navigated his departure from the church, doing as little damage as possible. It was quite a feat to engineer his escape, probing alternate career options; I give him high marks for courage and integrity, dealing with job and family life as he discovered there is much more to life than obsession with Jesus. He also discovered The Clergy Project, and ended up playing a major role in this support organization for clergy who have left the faith. It’s not hard to see that Bekius excelled as a pastor, because this is the approach he follows in the book. Just being so truthful is a major asset, but at the end of each chapter he asks for truth and trust from his readers. He poses questions for “everyone,” then for “Christians,” and finally for “atheists and skeptics.” I appreciate his patience and calm willingness to dialogue with the folks in the pews he left behind. He urges people to listen to one another, without judging and attaching labels—while acknowledging that we can hit a brick wall trying: “Now maybe they will eventually give us good personalized reasons to conclude that, yes, in fact, they are evil or stupid or a corrosive waste of time, and if so, we will handle them accordingly.” (p. 188). For the last three years I have been assembling what I call The Cure-for-Christianity Library© (after Mark Twain’s witticism, “The best cure for Christianity is reading the Bible.”) There are now well more than 200 titles, and quite a few are by clergy who have left religion behind. 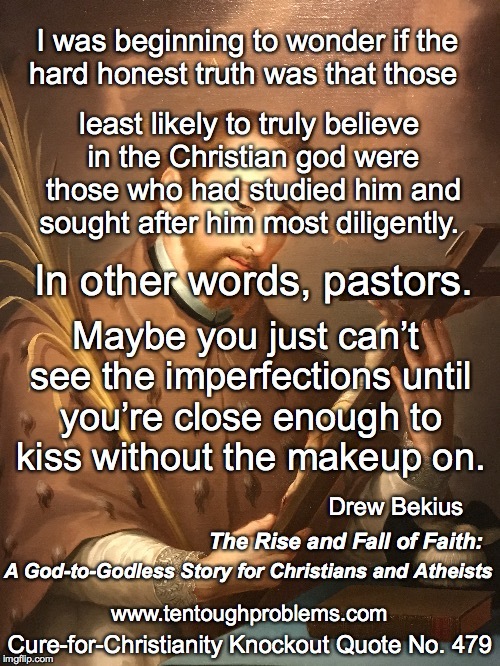 We do have a story to tell, after seeing the faith close-up “without the makeup on.” We’re fortunate that Bekius has written his story to add to this catalogue. He has given us a gracious, careful, thoughtful—and highly readable—account of his escape from faith. The Cure for Christianity Library can be found here.